Earlier this year, Vietnamese-American poet and writer Ocean Vuong won the prestigious 2017 T. S. Elliot Prize for his poetry collection Night Sky With Exit Wounds. 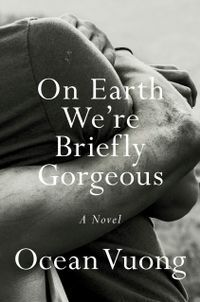 According to The Booksellers, Ocean Vuong's debut novel is titled On Earth We're Briefly Gorgeous, which is also the name of one of his poems. The novel will hit bookstores in June 2019. Fans of Vuong can already pre-order the book on Amazon here. The cover of On Earth We're Briefly Gorgeous. Photo via Amazon. On Earth We're Briefly Gorgeous will take the form of a letter sent from a son in his late twenties to his mom who cannot read. According to the book's synopsis, the story reveals a piece of a family's history set in Vietnam, as Vuong explores subjects such as race, class and sexuality. Penguin Press bought the US publication rights for the book. The UK rights for the book were then bought by Robin Robertson, an associate publisher at Random House's Jonathan Cape imprint. Jonathan Cape has published works by renowned authors such as Salman Rushdie, Jeanette Winterson, Alice Oswald, Irvine Welsh, Joe Sacco, Marjane Satrapi, Mark Doty, etc. Robin Robertson was also the editor of Vuong's first poetry collection Night Sky With Exit Wounds. "Ocean Vuong writes about language and story-telling, race, the aftershocks of war, the refugee experience, domestic violence, PTSD, masculinity and queer sexuality, but he does so without polemics and without the usual hectoring tone. His voice is quiet; so quiet, we physically lean in to listen more closely. And we learn quickly that this is a man whose words are worth close study, because each word is the product of experience and examination," Robertson told The Booksellers. On Earth We're Briefly Gorgeous will be distributed in Germany, Italy and France under Hanser, La Naveo Di Teseo, and Gallimard, respectively.